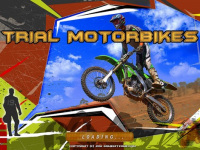 Trial Motorbikes will be a fondness for lovers of motorcycles. Various challenges while riding a trail bike are presented with 3D graphics and nice sound that can get you addicted. Time needed to reach the finish line is the main target for players to win every level in the game. The shorter the time spent, the greater the chance of success to win the trophy. Using nitro while going on steep climbs will be very helpful to get the long distance in a short time. To earn nitro, perform a backflip when jumping after incline. Use left arrow key when the motorcycle is high in the air and your nitro will be 100% charged. There are 4 kinds of motorbikes and 15 levels available. But not all is ready at the beginning of the game. You must win trophies to be able to play the next levels. Whereas motorbikes can be used by winning at least 2 gold trophies. Left/Right Arrow Key = Roll Left/Right. Up/Down Arrow Keys = Move Forward/Backward. Perform a backflip to earn nitro. Use it to jump over long distance. Bike racing with lots of extreme action. Race your way through various challenging tracks on your trusty motorbike.